We loved Bailey's on the Lake! It reminded us of our childhood cabin on Superior with great lake views and amazing wood detailing in the house. Fireplace was a highlight as well as lakeside family style eating. I called to get driving directions to the lodge as it was confusing using GPS and being unfamiliar with the area. Tammy stayed on the phone with me, guiding me turn by turn, until I got to my cabin. Great customer service. Lovely cabin with a lot of great amenities, space, and warmth. We enjoyed our stay as the location was perfect for what we were doing. The area was quiet and peaceful. We totally enjoyed our stay. Beautiful condo. Had every thing for a perfect visit. Would love to come again. We didn't have any experience working directly with anyone, which suited us well, as it means we didn't have any questions, concerns or complaints at all! The house was excellent for a couple, very cozy and cute. We were there for our honeymoon, and we loved the privacy. The view was phenomenal, we LOVED being so close to the lake and really enjoyed the moonrise by the beach campfire. Very cooperative. I'm sure all the minor issues mentioned above will be taken care of by the time we return. Great location. The condo is perfect for a couple. Nice appliances. Wood-burning fireplace was great when the weather cooled off outside. I would recommend bringing fire-starter sticks to get the fire going. You can pick up firewood at the gas station or grocery store just down the road. Just a few minor problems that we reported and should be fixed by the time the next renters come in ... 1. The recliner nearest the fireplace did not recline, was in need of repair. ... 2. The wall heater in the bathroom didn't work ... 3. The recycling bins at the end of the building were overflowing. On a more positive note, the outside common deck was awesome for watching the lake. They had small gas-burning fire pits on the deck as well. You'll need a lighter from the front desk to get them going, the auto-lighters don't work. Both the pool and the hot tub were nice to use and the pool area was well taken care of. Towels are by the pool, so you don't need to bring towels from your room. Pizza at the Coho Cafe in Tofte was great. Also, be sure to try their caramel covered croissants. Stopped at Blue Fin for cocktails ... a little pricey. A martini and glass of wine was $20. But, the real treasure is the North Shore itself. Take time to explore the numerous backroads, waterfalls, hiking trails and scenic sites. I believe we worked with Beth for most of our questions before arriving and she was terrific. She had a great attitude and answered all questions without having us feel like we were a bother. The location was the best we have experienced staying on the North Shore of Lake superior. We had beautiful Moon-rises (when it wasn't cloudy) each night. Being so close to the lake was the biggest plus. The hand painted watercolors in each room also impressed my wife. Didnt have too. Hassle free experience! A fanastic get away in a perfect setting right on the lake. Well needed tranquility in a bueatiful home from home. Location was perfect for us. House is charming and very clean. Instructions were clear and easy. Thank you! Beautiful space and incredible mountain view. Loved the Scandinavian design, artwork and local pottery. The BBQ grill was rusted and fell apart, and staff brought us a new one! That was terrific. Great location, nice home, private, beautiful shoreline. This cottage is as close to the lake as you can get without being in the lake! Clever use of space and very warm and welcoming. Great little house for a family getaway! Very nice little cabin. Everything was clean and well kept. I set up everything online so don't have any experience with members of the team. 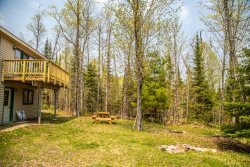 Towering Pines is a lovely location, private and near Lake Superior. The house is spacious and comfortable. We love the screened in porch but would really like it if the springs on the chairs were replaced so they would be more comfortable (second year I've made this comment!) I would highly recommend the house for a family vacation! We will likely use your service again. This was our first time using Cascade Rentals. We had a lovely stay. The unit has lots of space and is ultra clean and nice. A couple of recommendations: 1) It would be very nice to have some outdoor chairs available to enjoy the walkout area in the lower level. The balcony is too small to sit with friends and a glass of wine, so something below on the lower level would be very nice. 2) There were four adults and a child in our group, and we like to cook. The pans available were pretty small for a larger group, so it would be nice to have one larger frying pan and some larger pots. I ended up using the one cast iron griddle for lots of things and it was pretty small. If six adults stayed there, I would say the cooking pans were definitely not adequate for any group that likes to cook. 3) It would also be nice to have another love seat or a couple more comfy chairs in the lower level for watching movies and "lounging". 4) We ran out of plates long before the dish washer was full, so we either had to hand wash before our next meal together or run the dishwasher mostly empty. More plates would be lovely. You made setting up the rental super easy. The cabin was right on the water and had great views. We will be back next year! We only required interaction with a team member when requesting additional bed pillows one evening and the interaction was flawless. Any other time we ran into staff they were pleasant. We enjoyed our stay in the Wolf Den! Amazing view and comfy/cozy room. Loved the remodeled bathroom. Helpful staff when needed. We had fun perusing the extensive VHS collection! When I had to contact to add a person they were very helpful and nice. They also called and warned us about some work that was done so we wouldn't freak out. Cabin was super cute, had everything we needed. Location was great, easy walk to restaurants and shopping. The grounds were kept up well and the flowers were lovely. The view was great, we would get up and sit at the table and just look out at the water. We enjoyed our stay. No cable but having net flicks was nice. Although we were looking forward to the sauna but it was out of order.